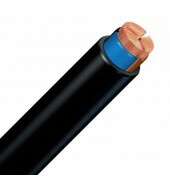 Unarmored cables for installation in marine and offshore applications with special performance on flame propagation, low emission of smoke and acid gas. Enhanced mechanical, cold, weather, and oil resistance properties. Soft annealed stranded Class 5 copper, Sector shaped in conductor sizes larger than 35 mm2 (use same terminations as per circular ones) according to IEC 60228, Halogen free cross-linked polyethylene (HF XLPE) insulation according to IEC 60092-3 & IEC 60092-351, Halogen free thermoplastic polyolefin (SHF 1+) outer sheath according to IEC 60092-359.